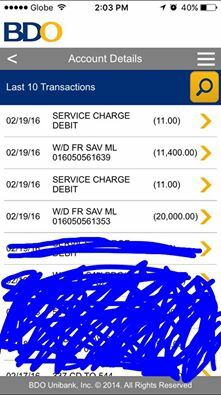 MANILA, Philippines- A netizen's bank account almost got drained after withdrawing at a tampered ATM machine. A certain Jayvi Villar is blaming a tampered ATM machine inside Banco De Oro (BDO) Bonifacio Global City Picadilly Star Branch for unauthorized withdrawals made in his bank account. According to him, the unauthorized withdrawals amounting to P30,400 in total were made on February 19, 2016 at an ATM machine in Philippine Business Bank Calamba branch at around 10pm. Villar called BDO as soon as he found out about the illegal transactions. However, he was advised that the incident will still be investigated. “I'm pulling strings to quickly solve this situation,” Villar said. Villar stressed that it was his first time to experience card skimming. Cybercriminals nowadays use skimming devices and attach it to any ATM machine in order to illegally copy your account details whether in your ATM card, debit card, or credit card. All cards inserted into the card slot of an ATM machine with a skimming device will be copied magnetically. Using a regular computer with an extraction software, skimmers will be able to obtain the copied information from your card. They also use a “decoy ATM keypad”, which is a modus keypad attached on top of the original ATM keypad of the banks. This decoy ATM keypad has a “key-stroke recorder that will record your PIN on it. Some skimmers install hidden cameras somewhere in the vicinity of the ATM machine with the view of the ATM keypad to obtain your PIN by following your finger movement. Once skimmers obtain your information and PIN, they will be using a card replicator or card maker to print a copy of your card and do whatever they wish to do with it.